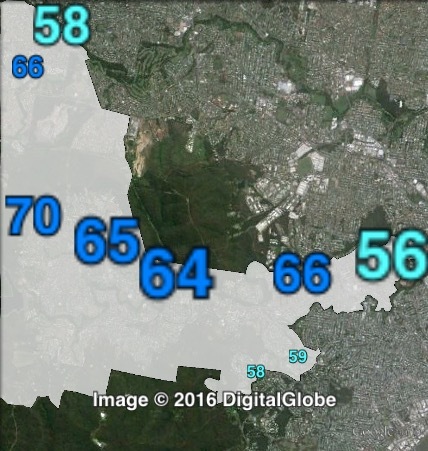 North-western Brisbane. 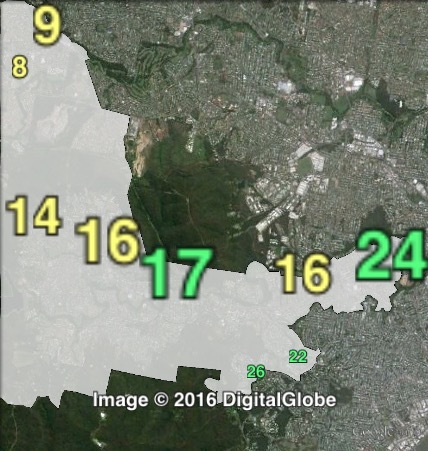 The Gap covers the suburbs of Ashgrove, Bardon, Ferny Grove and the Gap. Map of The Gap’s 2012 and 2016 boundaries. 2012 boundaries marked as red lines, 2016 boundaries marked as white area. Click to enlarge. 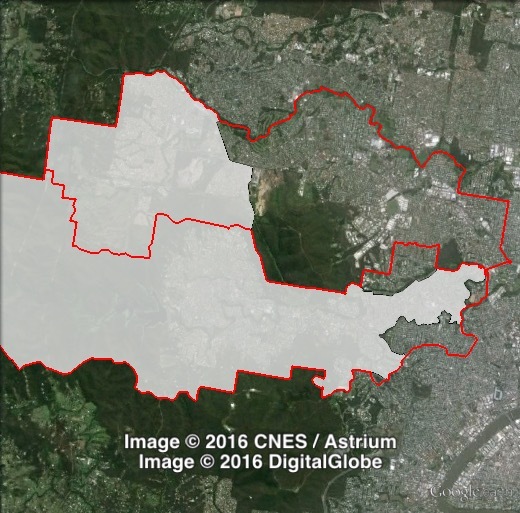 The Gap shifted further away from the Brisbane CBD, losing parts of Ashgrove to Paddington and Enoggera, and gaining Ferny Grove from Enoggera. 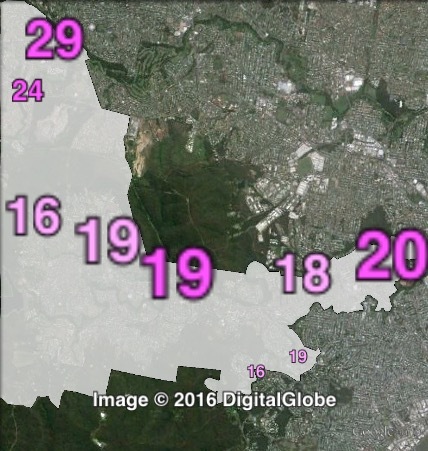 These changes cut the LNP council margin from 21.5% to 21.1%, and cut the LNP mayoral margin from 22.4% to 22.3%. The Liberal Party’s Geraldine Knapp was first elected to represent the Gap in 1997. She was re-elected in 2000, and in 2004 with a 17% margin. She was re-elected with an increased 18.7% margin in 2008 despite an unfavourable redistribution, and again in 2012 with a 21.5% margin. Knapp resigned in May 2015, and was replaced shortly after by the LNP’s Steven Toomey as a casual vacancy. No by-election was needed due to the impending 2016 election. The Gap is a Liberal National ward held by a large margin, but the LNP has recently lost their longstanding councillor, and the ALP has done well in the area at the recent state election, so Labor will be hoping to significantly cut back on the LNP margin. 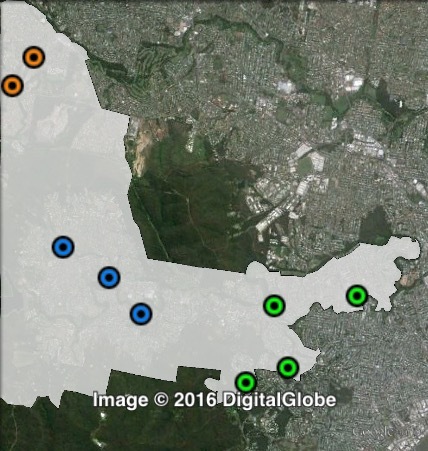 Polling places in The Gap at the 2012 Brisbane City Council election. Central in blue, East in green, North in orange. Click to enlarge. Booths in The Gap have been split into three parts: east, north and west. The LNP won a large majority of the primary vote in all three areas, ranging from 60% in the east to 66% in the west. The ALP primary vote ranged from 18% in the west to 27.5% in the north, while the Greens primary vote ranged from 8.6% in the north to 21% in the east. Liberal National primary votes for councillor in The Gap at the 2012 Brisbane City Council election. Labor primary votes for councillor in The Gap at the 2012 Brisbane City Council election. Greens primary votes for councillor in The Gap at the 2012 Brisbane City Council election.